Ordering and Delivery was easy and efficient. I have sent a crumb cake to each of my nieces and nephews for their birthdays this year. It was better than gold for them. THey all grew up in Nutley and we frequented your bakery very often and we all loved your crumb buns, When my husband and I visited back home last year we stopped in and got crumb buns for ourselves and my brother and his wife. Just as we had remembered. Then I saw I could order them on line. What a gift idea. My only disappointment was they were out of stock for over three weeks and so one of my birthday gifts was a few weeks late. But delivery has been wonderful and I have even taken to ordering a whole sheet and freezing it so my husband and I can enjoy for a long time. Thank you for keeping the great quality in your product and you can be sure I will be ordering again come Christmas. The crumb cake was sent asa Birthday Gift ! The recipient was thrilled . Perfectly packaged and fresh right out of the oven ! Thank you Styertowne for always being a part of our celebrations!!! Thank you! The crumb cake made it to Hawaii! It arrived in perfect shape and tastes delicious! Arrived safely and enjoying the memories of New Jersey in Carpentaria California with family and friends all Labor Day weekend! Travelled to visit the grandkids and took one along. A treat for the whole family enjoyed. Extremely good. More crumbs then cake. For mom’s birthday in Florida, she loved it, thx! Delicious. I will order this again. Sending your famous crumb cakes to my childhood friend now living in Florida turned into a much needed taste memory. Sometimes you can take the person out of Clifton but you can’t take the ‘Clifton’ out of the person. Thank you so very much for offering this wonderful service/ opportunity. They both arrived fresh without a crumb lost!! 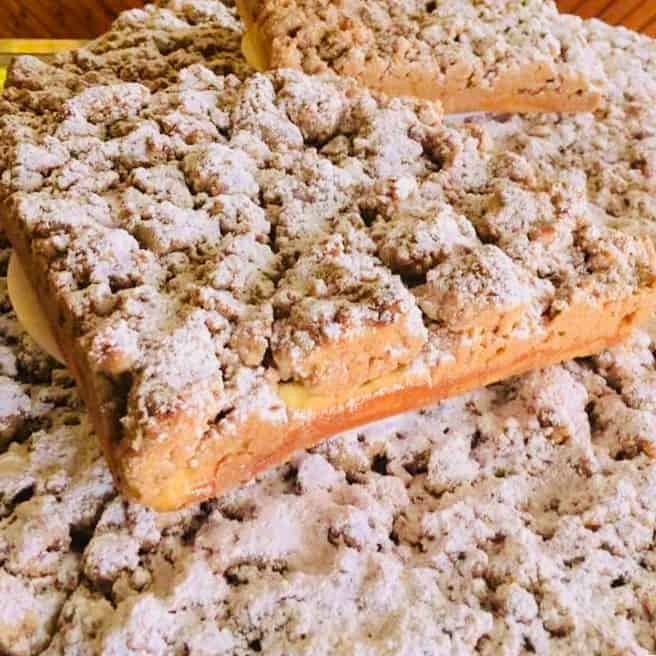 I moved from Nutley 30 years ago — but still get a craving for this crumb cake. No bakeries in Florida compare to Styertowne Bakery!! LOVE THIS CRUMB CAKE!!! Not only were the crumb cakes perfect once they got to their destination but it was one of the easiest transactions I’ve ever done, and all from my couch!!! I will be doing this from now on!!! 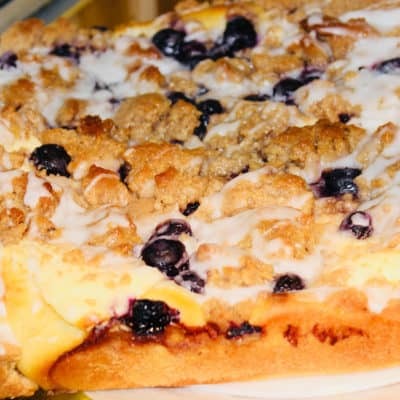 A friend gave my husband and I a coffee cake from Styretowne Bakery and the taste has been on our minds far too long… We live in Baltimore MD and ordered TWO (2) coffee cakes for Thanksgiving to enjoy with family and friends…. DELICIOUS, soft, buttery, cinnamony GOODNESS …. Thank You! We’ll order again and will try other baked goods. Crumb cakes were amazing and delivery was as promised. Thank you! Sent to my family; they loved it! So happy it arrived so fast & fresh! Christmas gift, receiver was very satisfied with the gift! Had it shipped to our friends who moved from Bloomfield to Texas. They LOVED IT!!! They came intact, quick, and are so delicious!!! This was delicious! It came highly recommended from people from my old Jersey City neighborhood as just like we would get back in the 1960s, & it did not disappoint. It took a few days to get to Florida via standard delivery, but it was still fresh & kept well. It was a gift for my cousin in North Carolina. He called to say it was GREAT! We did have some difficulty with UPS though. I did 3-day delivery. My cousin only uses a P.O. box in Claremont, NC. He goes to the post office every day. They call him if there’s a package. So I put a notation on the note line to say that. UPS called to say they don’t deliver to post office boxes. I had to call my cousin to ask for his street address. Called UPS back but they said it would be delivered no that day but the following day (that’s 4 days). Then I got a message from the UPS tracking that said they tried to deliver to the house (the same day), but that an ADULT SIGNATURE WAS REQUIRED. WHAT THE HECK???? The next message we got on the 4th day was that it was LEFT ON THE PORCH. I’m waiting to find a UPS driver to find out what their policy is. Maybe you should update your web site; maybe UPS should get their policies straight; maybe UPS should train their drivers properly. All in all, my cousin loved it. Brought back memories of his childhood in Clifton and of his mother. Best Christmas breakfast EVER. I will order this again. The coffee cake was a good size for the price. It was great that I could have this shipped to my Virginia home. I really miss my Jersey food. The coffee cake was excellent! My cake has not arrived as yet. When it does I know it will be good. Still the best in the world! Sent these to my son away at college. He and his friends LOVED them!! We grew up in Bloomfield and our parents brought us to Styertowne Bakery every Sunday! 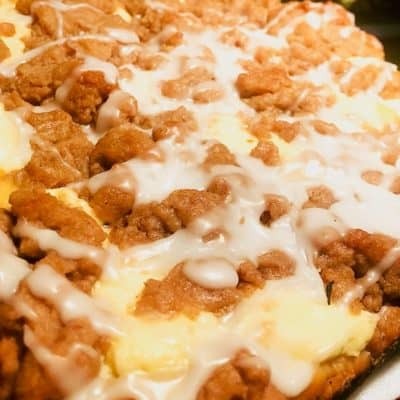 We moved to Oklahoma and my brothers and I absolutely love the crumb cake….best ever!! Now the 3rd generation is on board!! Absolutely delicious! Delicious crumbcake full of crumbs just like I remember from living in the New Jersey area. Arrived so incredibly fresh! You won’t be disappointed! Nothing beats that taste of home that only a Styertowne Crumb Cake can give to a transplanted Native. Absolutely delicious! Not a crumb left!! Haven’t had this since I was a kid. The grand kids never experienced crumb cake and they loved it. They can’t wait for another order. Sent to the boys at college. They love it! The crumb cake is second to none. The only problem is deciding whether to get plain, cheese or blueberry. I had one mailed to my cousin after her husband passed away. They had been from the Clifton area and it was a special treat for her to receive a cake from Styertowne Bakery. Thank you! Best crumb cake ever! Had it shipped all the way to Vermont.